We began with commentators Kevin Kelly and Andy Boy Simmonz doing a sports-style introduction from ringside. They talked about the main event and hyped the appearance of “The Dominator” Great O-Kharn with accompanied graphics. In a move right out of UFC, Kelly talked over a graphic that listed the rules of pro wrestling, going as far as explaining what pinfalls and countouts are. A great opening that established the sports-feel of the program, and made a conscious effort to explain the sport to new fans. This was a fun opener with these two working well. While Brookes often works at a sprint, here Liger controlled much of the match with grappling, including an early Gory Special. Brookes would gain the initiative as they brawled outside following Liger hitting a cannonball on the outside. In a rare instance of heel work from Brookes, he used the ring apron to trap Liger’s head so he could stomp on it. Liger would ultimately win with a brainbuster. There was a display of sportsmanship between the two before Brookes kicked Liger low. He then tried to take Liger’s mask off, with El Phantasmo running in to scare him off. Lord Gideon Grey came out. Dressed in a sharp three-piece suit, he combines the standard aristocratic gimmick with the sense that there’s something not quite right about him. Think Lord Steven Regal crossed with George “The Animal” Steele. He announced that he has acquired the services of The Great O-Kharn. This was a complete squash, with The Great O-Kharn just dismantling his opponent. Tomoyuki Oka debuted with this gimmick at Strong Style Evolved UK, and he certainly seems much more comfortable with it now than he did back then. He won with the iron claw slam. Afterwards, Grey stole the microphone to announce his charge as the victor. They then aired promo shots of Zack Sabre Jr. and KUSHIDA posing to continue the hype for the main event. Kelly explained that O-Kharn’s opponent was part of Revolution Pro Wrestling’s contenders division, and that he was now joined by another example of that division, Dan Magee. They did a deliberately stilted interview before Sha Samuels interrupted. He pushed Magee out of the way, ranting to Kelly about being a former British Heavyweight Champion and having signed a huge contract to return. Samuels literally shoved the contract at Kelly. Magee was hovering behind Samuels and Kelly, doing a good job of selling his annoyance at the situation, and ultimately interjected to tell Samuels to leave Kelly alone. Samuels then suckerpunched Magee, and they had a short brawl before security broke it up. This was a really good angle in which Samuels came across as a bigger star in three minutes than he did in three months of World of Sport. They then threw to a pre-recorded interview between Andy Boy Simmonz and Colt Cabana from the balcony of York Hall. In a segment that spliced in archive footage of Cabana’s previous matches in RevPro, they talked about why Cabana is a fan of British pro wrestling, has traveled the world, and how he’s a former British Heavyweight Champion. They then announced that Cabana will be in action next week. Nothing complicated, but an effective tease for a match. Before the match, there was again another nod to UFC, as they brought a “tale of the tape” style graphic. Simmonz predicted that ZSJ will win. They had a very good match that went almost 20 minutes, with Sabre winning by submitting KUSHIDA with Orienteering With Napalm Death after countering an attempted bridging pin. During the match, it was confirmed that Chris Brookes would face El Phantasmo next week. This match very much conformed to Sabre’s formula in New Japan, with him dominating on the ground -- but ultimately getting goaded into a striking exchange. There were fun grappling exchanges throughout, with KUSHIDA repeatedly trying for the armbar. From early on in the match, Chris Ridgeway came out to watch from the entrance ramp, and while he didn’t interfere, Sabre’s patronizing reaction to him afterwards hinted at a future match to come. The show ended with Sabre walking to the back. The wrestling was good throughout, while the pacing and format made it a very easy show to watch. 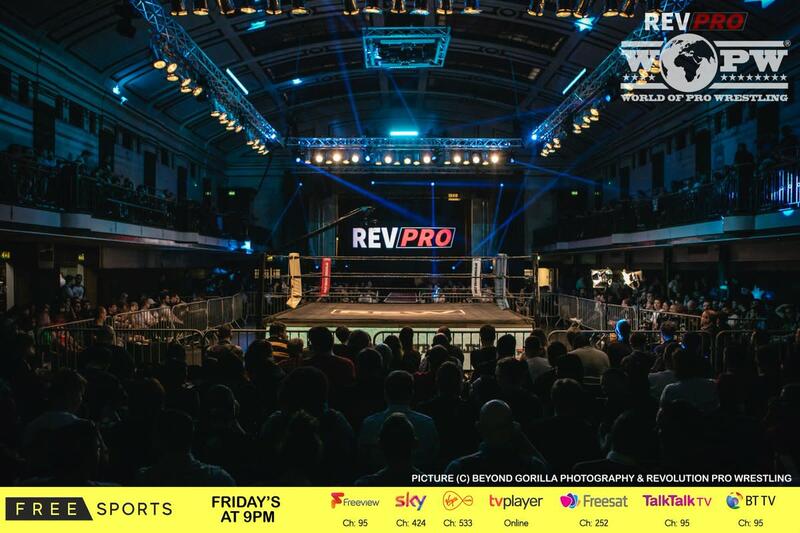 York Hall looked great, which speaks to the return on investment of bringing in a specialized production company considering that RevPro is often being criticized for RPW On Demand’s production values. There were a few issues with the sound, with the sound of the entrance music being captured over the live microphones, which made it challenging to mix the sound so you could hear the music and the commentators. This did seem to get better throughout the show, so maybe it can be explained as an example of teething problems. The commentary team were good throughout, with Simmonz playing the heel well. One note is that the UFC-style presentation would work even better if Simmonz could provide more technical rationales for why he predicts certain outcomes. Likewise, while they did a really good job of setting up things for next week, throwing back to Kelly and Simmonz so they can do a hard sell for next week’s episode would be a good idea. But these are minor issues. This was not just a great British pro wrestling television show, but a great pro wrestling show full stop.